Background: Business process management systems (BPM) can automate all processes in an organization. These systems provide the possibility of identifying, modeling, deploying, implementing, function managing, integrating with other information systems, monitoring and improving an organization's business processes in a standard form. As far as the authors know, no related research has been performed in this field. 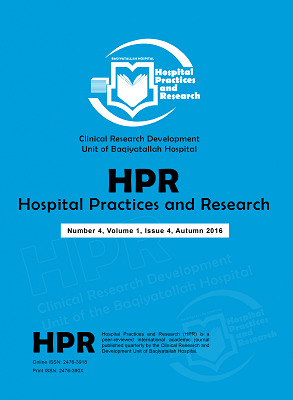 Objective: This study investigated the feasibility of establishing business process management in hospitals in Iran. Methods: This qualitative research involved 13 participants selected by purposive sampling, including faculty members from medical universities and managers of hospitals. Data was collected through semi-structured interviews and analyzed using qualitative content analysis. Results: Interviewees were asked about the requirements for establishing BPM. To more easily understand the content, the interveiwees’ responses were classified into two general categories: prerequisites for guidelines and procedures, and prerequisites for electronic healthcare records. Conclusion: Despite slight differences between the two groups of respondents (healthcare administrative experts and medical informatics management experts), there was a consensus among the experts about the effectiveness and efficiency of using BPM in healthcare organizations. Furthermore, respondents maintained that, even though numerous prerequisites would be needed for the establishment of this kind of processing reform given the current situation in Iran, some benefit could be gained from implementing to any extent possible this approach in Iran’s hospitals. Rudden J. Making the Case for BPM-A Benefits Checklist. BPTrends. http://www.bptrends.com/publicationfiles/01-07-ART-MakingtheCaseforBPM-BenefitsChecklist-Rudden.pdf.Published 2007. Huser V, Rasmussen LV, Oberg R, Starren JB. Implementation of workflow engine technology to deliver basic clinical decision support functionality. BMC Med Res Method. 2011;11:43. doi:10.1186/1471-2288-11-43. Anyanwu K, Sheth AP, Cardoso J, Miller JA, Kochut KJ. Healthcare enterprise process development and integration. J Res Pract Inf Technol. 2003;35(2):83-98. Kumar A, Shim S, editors. Eliminating emergency department wait by BPR implementation. 2007 IEEE International Conference on Industrial Engineering and Engineering Management. IEEE; 2007. Lenz R, Reichert M. IT support for healthcare processes–premises, challenges, perspectives. Data Knowl Eng. 2007;61(1):39-58. Becker J, Fischer R, Janiesch C. Optimizing US health care processes-A case study in Business process management. AMCIS Proceedings; 2007:504. Chen P. Goal-oriented business process monitoring: an approach based on user requirement notation combined with business intelligence and web services [Thesis]. Canada: Carleton University, Canada; 2007. Müller R, Rogge-Solti A, eds. BPMN for healthcare processes. In: Proceedings of the 3rd Central-European Workshop on Services and their Composition (ZEUS 2011). Karlsruhe, Germany; 2011. Love PE, Holt GD. Construction business performance measurement: the SPM alternative. Bus Process Manag J. 2000;6(5):408-16. Soti P, Pandey S. Business process optimization for RHIOs. J Healthc Inf Manag. 2006;21(1):40-47. Scheer AW. ARIS—From the Vision to Practical Process Control. In: Scheer AW, Abolhassan F, Jost W, et al, eds. Business Process Excellence. Berlin Heidelberg: Springer; 2002:1-13. doi:10.1007/978-3-540-24705-0_1. Hess R. The missing link to success: using a business process management system to automate and manage process improvement. J Healthc Inf Manag. 2008;23(1):27-33. Weber RP. Basic Content Analysis. Sage; 1990. Hsieh HF, Shannon SE. Three approaches to qualitative content analysis. Qual Health Res. 2005;15(9):1277-1288. doi:10.1177/1049732305276687. Wildemuth BM. Applications of social research methods to questions in information and library science. Westport, CT: Libraries Unlimited; 2009. Roberts CW. Other than counting words: a linguistic approach to content analysis. Social Forces. 1989;68(1):147-77. Stone PJ, Dunphy DC, Smith MS. The General Inquirer: A Computer Approach to Content Analysis. Cambridge, MA: MIT Press; 1966. Graneheim UH, Lundman B. Qualitative content analysis in nursing research: concepts, procedures and measures to achieve trustworthiness. Nurs Educ Today. 2004;24(2):105-112. doi:10.1016/j.nedt.2003.10.001. Wiener A, Diez T. European Integration Theory. Oxford: Oxford University Press; 2009. Krippendorff K. Content analysis: An Introduction to its Methodology. Thousand Oaks, CA: Sage; 2004. Priest H, Roberts P, Woods L. An overview of three different approaches to the interpretation of qualitative data. Part 1: Theoretical issues. Nurs Res. 2002;10(1):30-42. doi:10.7748/nr2002.10.10.1.30.c5877. Lim ET, Pan SL, Tan CW. Managing user acceptance towards enterprise resource planning (ERP) systems–understanding the dissonance between user expectations and managerial policies. Eur J Inf Syst. 2005;14(2):135-149. doi:10.1057/palgrave.ejis.3000531. Fox J, Dunlop R, editors. Careflow: theory and practice. International Conference on Business Process Management; 2007: Springer. Mulyar N, Pesic M, Van Der Aalst WM, Peleg M, editors. Declarative and procedural approaches for modelling clinical guidelines: addressing flexibility issues. International Conference on Business Process Management; 2007: Springer. El-Hassan O, Fiadeiro JL, Heckel R, editors. Managing sociotechnical interactions in healthcare systems. In: International Conference on Business Process Management. Springer; 2007. Peleg M, Soffer P, Ghattas J, editors. Mining process execution and outcomes–Position paper. In: International Conference on Business Process Management. Springer; 2007. Ghattas J, Soffer P, Peleg M. Improving business process decision making based on past experience. Decis Support Syst. 2014;59:93-107. doi:10.1016/j.dss.2013.10.009. Grigori D, Casati F, Castellanos M, Dayal U, Sayal M, Shan MC. Business process intelligence. Computers in Industry. 2004;53(3):321-43. Blobel B. Authorisation and access control for electronic health record systems. Int J Med Inform. 2004;73(3):251-257. doi:10.1016/j.ijmedinf.2003.11.018. Alhaqbani B, Fidge C, eds. Access control requirements for processing electronic health records. In: Business Process Management Workshops. Berlin Heidelberg: Springer; 2007. Mandl KD, Markwell D, MacDonald R, Szolovits P, Kohane IS. Public standards and patients’ control: how to keep electronic medical records accessible but private. BMJ. 2001;322:283. doi:10.1136/bmj.322.7281.283. Motta GH, Furuie SS. A contextual role-based access control authorization model for electronic patient record. IEEE Transactions on Information Technology in Biomedicine. 2003;7(3):202-7. Bacon J, Moody K, Yao W. A model of OASIS role-based access control and its support for active security. ACM Transactions on Information and System Security (TISSEC). 2002;5(4):492-540. Hickman GT, Smaltz H, eds. The Healthcare Information Technology Fieldbook: Tactics, Tools, and Templates for Building Your IT Plan. HIMSS Publishing; 2008. Mayring P. Qualitative content analysis–research instrument or mode of interpretation. In: Kiegelmann M, ed. The Role of the Researcher in Qualitative Psychology. Tubingen: Verlag; 2002:139-148. Speziale HS, Carpenter DR. Qualitative Research in Nursing. Philadelphia: Lippincott Williams & Wilkins; 2011. Buisman HJ, Tesanovic A, Udink RT, Inventors. Patient monitoring system. Google Patents; 2012. Brown SJ, Inventor. Multi-user remote health monitoring system. Google Patents; 2015. Say J, Tomasco MF, Heller A, et al, Inventors. Analyte monitoring device and methods of use. Google Patents; 2016. Dadam P, Reichert M, Kuhn K. Clinical workflows—the killer application for process-oriented information systems? In: BIS 2000. London: Springer; 2000:36-59. doi:10.1007/978-1-4471-0761-3_3. Wakamiya S, Yamauchi K. What are the standard functions of electronic clinical pathways? Int J Med Inform. 2009;78(8):543-550. doi:10.1016/j.ijmedinf.2009.03.003. Gooch P, Roudsari A. Computerization of workflows, guidelines, and care pathways: a review of implementation challenges for process-oriented health information systems. J Am Med Inform Assoc. 2011;18(6):738-748. doi:10.1136/amiajnl-2010-000033. Kirk DM, Gehring NC, Butorac GJ, Inventors. Health support system. Google Patents; 1995. Dessertine AL, Inventor. Patient compliance and status monitoring system. Google Patents; 1991. Kaish N, Inventor. Patient operated system for testing and recording a biological condition of the patient. Google Patents; 1996. Brown SJ, Inventor. Health management process control system. Google Patents; 1999. Mulyar N, Van der Aalst WM, Peleg M. A pattern-based analysis of clinical computer-interpretable guideline modeling languages. J Am Med Inform Assoc. 2007;14(6):781-787. doi:10.1197/jamia.m2389. Buxey FD, Martin NA, Nenov VI, Inventors. Method and system for dispensing communication devices to provide access to patient-related information. Google Patents; 2002. Jacobson DA, Inventor. Method and system for providing medical information. Google Patents; 2002.